Interview with GOAT Gear: Get Out and Train™! Today we were lucky enough to interview Scott Greenstone, the founder of GOAT Gear, about the Aquaspotter™. The Aquaspotter™ is a great product for open water swimmers and triathletes. It is basically a neoprene belt with a flag on it that you wear while swimming. The flag is 18″ tall and brightly colored so it is visible to all types of surface water crafts. It has received great reviews from swimmers, coaches, and boaters on its comfort, ability to improve stroke mechanics, and ability to make boaters more aware of swimmer presence. This is a very important product for open water swimmers and triathletes to have in their swim bags, especially when training open water on those hot weekends with a great deal of boat traffic. Here at Endurance Swimming, we support products that keep swimmers safe from any preventable accidents and that is why we have decided to conduct this interview to share with all of you! Endurance Swimming (ES): Tell us a little about yourself and how you came up with GOAT Gear? Scott Greenstone (SG): GOAT Gear, LLC was born when I spent a year training for the 2010 Lake Placid Ironman Triathlon. During my long hours of swimming, biking and running, many times I found himself wishing for training products that just didn’t exist…yet. Early inspiration nearly struck me in the form of a boat during one of my training swims in the Gulf of Mexico. As a lone swimmer in a large body of water, I realized that I needed a way to be more visible to the motorized craft that share those waters. 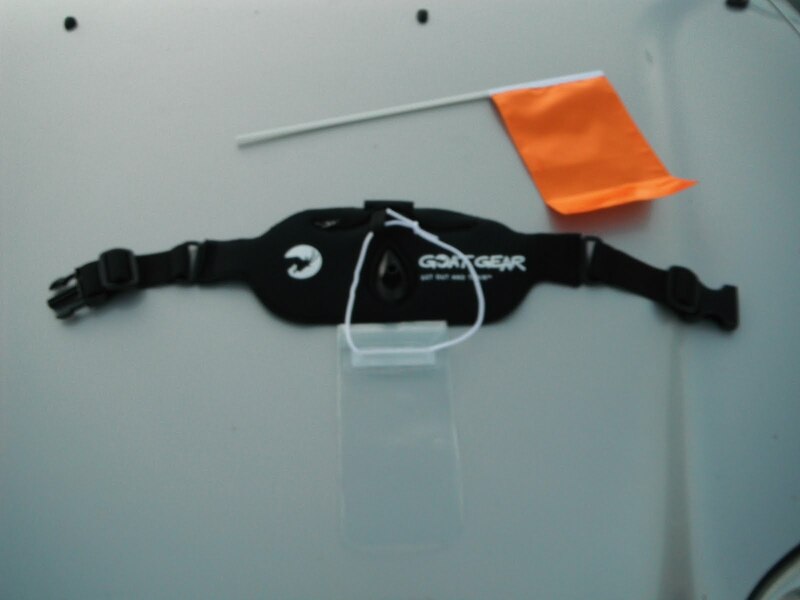 Research ensued and development began on the flagship product: the GOAT Gear Aquaspotter™ for open water swim training. The idea was an instant hit amongst newbies and accomplished athletes alike throughout the triathlon and open water swimming communities. Here at GOAT Gear, LLC, we strive to make quality training products that help all athletes Get Out And Train™. I am a devoted amateur athlete who has competed in over 100 running events including 17 marathons and has raced in over 30 Triathlons ranging from small, local sprints to Ironman Lake Placid. I am a registered nurse, father of two, a member of the Board of Advisors for Pace Racing, an original member of the MAPSo Multisport Team, and a medical volunteer for the ING NYC Marathon. I credit my devotion to endurance sports for changing my life… for the better…and I try to shares my passion with others whenever I can. ES: Can you tell us about the Aquaspotter™? What is included and how does it work? SG: Currently GOAT Gear has one product on the market, the Aquaspotter™. 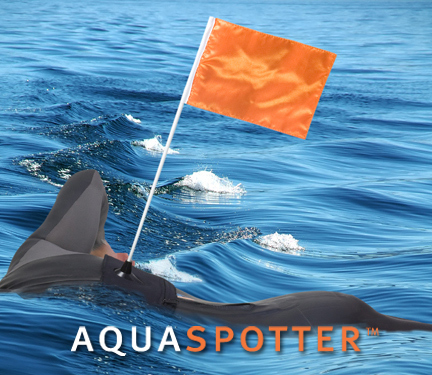 The Aquaspotter™ is a product that allows open water swimmers to be more visible to surface craft, lifeguards and spotters by placing a bright orange flag 18” above the surface of the water. Unlike other products that provide visibility, the Aquaspotter™ has virtually no drag because the product is worn around the waist as opposed to being dragged behind the swimmer. It is a simple, yet necessary, product that consists of a very comfortable neoprene belt with soft stretch fabric that goes around the waist. On the back of the belt is a flange that holds the 18”, lightweight, fiberglass flag pole with a bright orange flag attached. In addition, the Aquaspotter™ includes a zippered pocket that has a waterproof bag inside, so there is no longer the need to hide your valuables somewhere on the beach or under your car. An added bonus is that coaches have been reporting the potential for swim improvement in the pool as they can better visualize their students’ hip rotation. This in turn allows coaches to modify swimmers’ strokes as needed to become more efficient. ES: Now that the Aquaspotter™ is out on the market, what is next for GOAT Gear? SG: Now that we have released the Aquaspotter™ for sale, we are moving on to some new products that are in development. We are working on a product that will help triathletes quickly locate their bikes in transition after the swim. In addition, we are working on some other products that will help athletes Get Out and Train™. ES: Currently, who is using the Aquaspotter™? Are there any big name professionals on board yet? SG: Currently we have beginners all the way through professional coaches using the Aquaspotter™. In addition to triathletes, many snorkelers and snorkel guides are utilizing the Aquaspotter™ to help keep them more visible. The Aquaspotter™ is also starting to get noticed by various channel swimmers and long distance swimmers around the globe. We have people using the Aquaspotter™ in over 15 countries right now. ES: For other people out there trying to come up with products to make triathlon and open water swimming safer, what advice do you have to give based on your experiences? SG: I think it is important to perform market research before moving forward with your ideas. Although the idea may seem good to you, it needs to be validated prior to spending too much time and money. In our case, we surveyed lots of athletes to determine the level of interest in a product like this before any design work began. ES: That’s some good advice! What products would you consider your biggest competitors and what sets the Aquaspotter™ apart from them? ES: How have you used the feedback from open water swimmers and triathletes to help develop the design of the AquaSpotter and what are the reviews like so far? SG: We have 3 different testers of various abilities help test and refine the product over a 12 month period until we were satisfied with the performance and comfort. The reviews have all been stellar, ranging from Simon Gowen’s triathlon show to Utah Open Water, to reviews in Germany and Finland, as well as many others that are in the works. ES: We just have one more question for you today, what do you like to do when you are not working on improving the safety of triathletes and swimmers everywhere? Thanks for reading and be sure to stay safe out there! We have decided to put together a blog to share our information about open water swimming and training with the world! There will be posts about training, product reviews for swimming and triathlon, awesome videos, and other fun and inspirational topics. Please inform us about any topics that you would like to hear about and we will do our best to write about it. Don’t be shy, all questions and comments are welcome! Don’t be afraid to ask any questions about triathlon and open water swim training, triathlon and open water races, and anything else that you want to read about. We are excited to get rolling with this blog. We hope you learn a great deal and enjoy reading our blog just as much as we enjoy writing it for you! Thank you for following Endurance Swimming!